Say Congratulations! 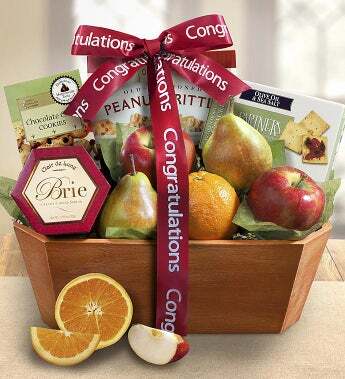 to someone special by treating them to a gourmet gift full of mouthwatering fruit and delectable snacks. The food experts at The Fruit Tree™ have paired fresh-from-the-tree fruits like seasonal pears and crisp apples, with complementing camembert-flavored cheese spread, sweet hazelnut cookies, nut crunch and flatbread crackers. All beautifully presented in a decorative wood basket and tied with a Congratulations ribbon.